I’m not gonna lie: this “pre-pilot” is pretty heavy. Its aim is to cover the entire industry, in its current state, platform by platform, element by element, inch by inch. By the end of it though, you should have a clear idea of where the video games industry stands at the moment, and the tools you need to understand where it might be going. Also, we’re having fun while discussing all this. Sounds appealing? Great, jump in! We’ll be back soon with what will probably more light hearted (but still super informative) shows. Wii U: All of Nintendo! I will improve my english because this one is better than the french version. If you’re a pc Gamer and wait for more mobility, I think virtual screen with devices like oculus rift could be a solution. (Sorry for my really bad english (hope I am meaningful enough, but i am not even sure for the word “meaningfull” :p). Our smartphones are becoming more and more powerfull. So an oculus rift with integred computation could be moved everywhere. No needs for physical keyboard, mouse or screen. You just need gloves wih sensors and you can work and play as home with virtuals keyboard, mouse and screen (I’ll stop comment in english ; I think i am not still ready for that :). Good show ! Clear and fun to listen to. So it is really not your fault I am still not sure what console to buy. And for the console to get, there will always be games on the other one that you’ll want to play, so I’d say try and look at it like this: which platform specific games are the ones you want to play the most? 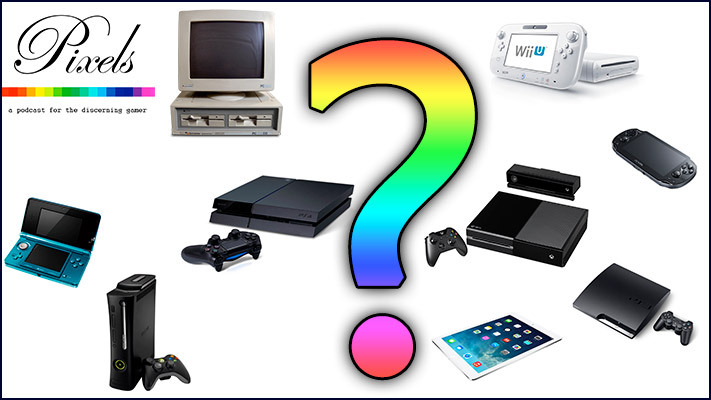 If you can answer that question, you’ll know which console to buy. Well, I am a huge Naughty Dogs fan so…. PS4 most likely. But you got me all confused with your WII U and kids and all. Regarding Mobile game, I Highly recommend to check out Simogo’s game (Device6, year walk). You mentioned essential games to pick up for the PC, I would like to thrown in The Elder Scrolls V Skyrim. I didn’t pick it up when t first launched but this year I saw it on sale for less than $5 and that is a huge steal for a great game with tons of content. It is on sale ever so often and I highly recommend it. Also I know that you and most of your guests are iOS users but we have great gaming on Android as well don’t forget that. Xcom is on Android as well as great titles that really lend themselves to mobile gaming like Telltale’s the Walking Dead and A wolf among us. If you do another A mobile focused episode it might be good to get someone like Jason Howell . Love the show keep up the great work.